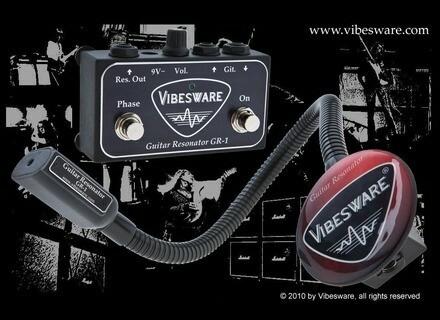 Guitar Resonator, Other Guitar Accessory from Vibesware. 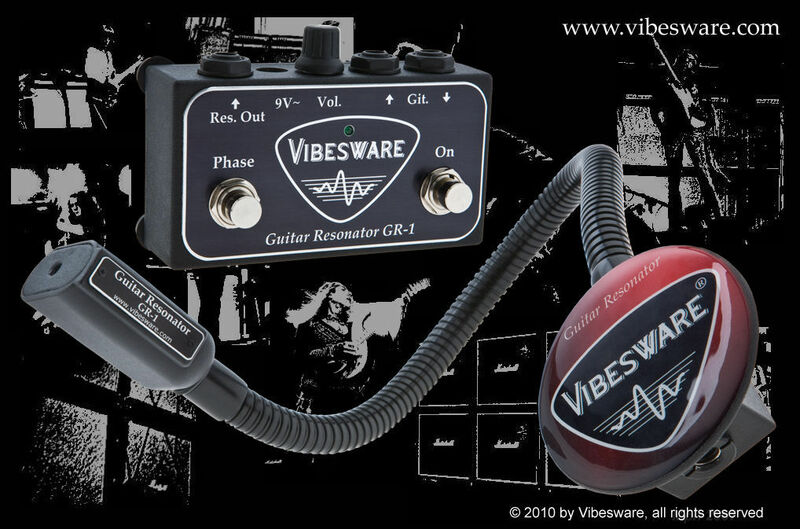 Vibesware® presents the Guitar Resonator, a new patent-registered harmonic feedback generator. It will bring you any string vibration feedback on stage, in recording studio or at home. At any time and with almost any equipment. It produces powerful and reproducible harmonics at any sound volume. Even if playing with headphones. Feedback sounds of a fully turnded up amplifier stack ? Tones passing into feedback whenever you want ? Generate any traditional feedback effects or create your own feedback style. The interesting thing is that the Guitar Resonator is stationary which means it is never fixed to your guitar nor hand-held. So electric guitars can be used without any modification. You can use both hands for normal guitar playing. The Guitar Resonator generates an alternating magnetic field from the guitar pickup signal. The string vibration is amplified when positioning the Resonators head near the strings. This vibration feeds back through the pickup so that a closed loop accurs. With it you can create amazing feedback tones, sounding very natural because they come directely from the strings. Thus the sound is not comparable with well known electronically generated feedback sounds. It rather sounds like a turned up amplifier, where the string feedback comes from the sound waves. ● Feedback is possible at any sound volume, even if playing with headphones. ● This also works fine with crunch or clean sounds. With sound wave feedback it would take a realy extreme amplifier gain to get the same feedback tones. ● The transition from normal tones into feedback can be controlled exactely and always reproducible. You don't need any time consuming experiments with amplifier gain and loudspeaker distance. ● By the strong magnetic field, you can generate extreme feedback tones which cannot be generated with normal amplifier/speaker feedback at all. For more info, visit Vibesware's site here. New AXL Solid Mahogany Body Guitars AXL has released Solid Mahogany versions for the Jacknife and Wavepoint models. Manta Ray HB with Flame Maple Top Reverend now offers the Manta Ray HB guitar with flame maple top. Part of their Set-Neck Series, the Manta Ray HB features two Reverend humbucker pickups, Reverend Pin-Lock tuners, Bass Contour control, block inlays and neck binding. Recording King Releases RD-06 & RD-07 Recording King presents the RD-06 and RD-07 acoustic guitar models.